The white kimono that most Japanese take their final journey in is called a kyokatabira. The word is split into two terms: kyo (経) which means Buddhist sutra, and katabira (帷子) which is a light, unlined kimono worn on informal occasions, such as rising in your own house in the morning. 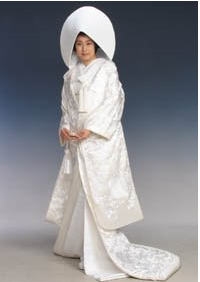 Katabira were traditionally made from hemp and came into fashion around the Heian period (794 to 1185). At the time, katabira were a form of underwear. They were stuffed with cotton and used to keep warm as a sort of wearable blanket. But as summer came and people shed layers, they soon learned that the simple, single-layered garment was just as comfortable in Japan’s humid and oppressive summer. These were eventually adapted for use in the bathhouse, which were called yukatabira (湯帷子). This word was later shortened to yukata, a light kimono that are still worn in Japan today— although the kanji 浴衣 is more commonly used. 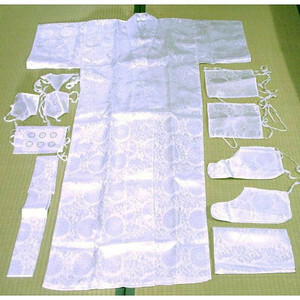 Buddhist priests preferred the rough hemp over the fine silks of the byakue and jōe, and took to wearing what was called kyōkatabira. As the name suggests, kyōkatabira were standard white katabira inscribed with Buddhist sutras. Kyōkatabira came to be work by Buddhist on pilgrimages as they travelled Japan. I sometimes hear people say that white is the color of death in Japan, but this is a mistake. White is the color of purity. For as long as anyone knows, white in Japan has been the color of purity, specifically ritual purity. 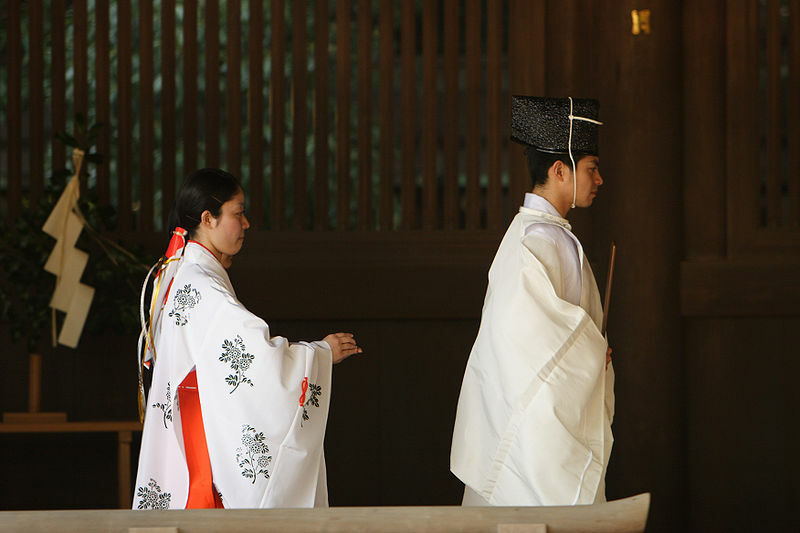 The native religion Shinto has always been concerned with cleanliness and purity. At most Shinto shrines there is a place for you to wash yourself before entering. Ritual purity means more than just taking a good bath, although that is a part of it. In order to be ritually pure, you must be cleansed of kegare (汚れ) meaning “impurities,” which can only be done through a serious of prescribed enigmas under the guidance of a priest. Wearing a white kimono is a visible sign of purity, and is generally done by only three classes of people; priests, brides, and corpses (or those soon to be corpses, like people commiting seppuku). 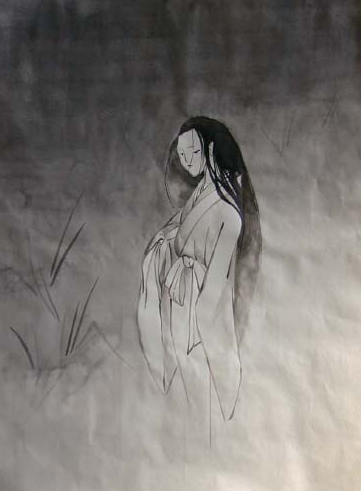 And of course yurei, Japanese ghosts. Around the 700s, Buddhism arrived in Japan and began to grow in popularity. Buddhism in Japan mixed with Shinto to create a unique religion quite different from its Indian origins. Over time, Shinto and Buddhism split until each oversaw a different aspect of humanity, the kami of Shinto overseeing the living and the deities of Buddhism caring for their souls in death. Buddhism slowly took over all funeral rites, which remains with way it is in Japan today. A complete shinishozoku will have the corpse dressed in a kyōkatabira with sutras written on the inside and folded right-over-left in the opposite style, a tankan-the triangle-shaped headband, a zutabukuro-a small carrying bag containing ferry passage over the Sanzu river of the dead, a walking cane, and coverings for the legs, arms, and back. The final item is a string of prayer beads nestled in the hands. What is the significance of folding the kimono right-over-left? A common occurrence in Japan is seeing a foreigner trying on a yukata for the first time, and eliciting a room full of gasps as they innocently take the right side of the yukata and fold it over the left. I did. And I had no idea why everyone was so shocked. I found out soon enough that the right-over-left style is reserved exclusively for corpses, Living people always—ALWAYS—fold their yukata or kimono left-over-right. But why? That, no one could tell me. It took some digging to find the answer, but it comes back to that old Asian favorite, class distinction by clothing. Apparently in ancient China the way you folded your kimono was a visible way to show your rank. Like foot-binding and long fingernails, it was also a way to purposefully hobble yourself to show that you did not need to work for a living. Folding your kimono left-over-right allows a greater freedom of movement, such as was required by field workers. The leisure class thumbed their noses at freedom of movement, and purposefully folded their kimono right-over-left. During the Nara period, when Chinese culture influenced Japan, this custom was taken up enthusiastically by the aristocratic classes. Death, however, knows no distinction of rank. 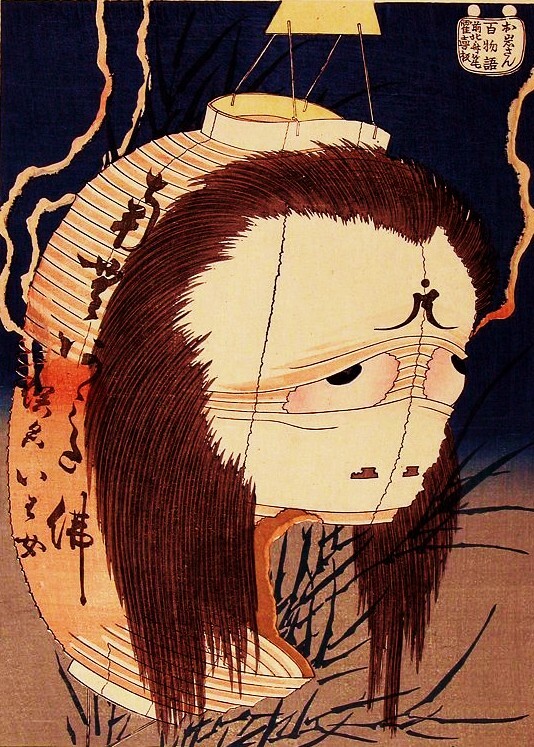 One of the principles of Japanese religion and folklore is that the dead are mighty, and you don’t want to offend them. So it became the custom that all dead people, no matter what they were in life, rose to the aristocratic right-over-left class and folded their kimonos that way for their final journey. So the white kimono, the kyōkatabira, is much more than a simple garment. It is a statement of transformation. It shows that here, on their last journey, a person has become ritually pure in the Shinto tradition, a holy pilgrim in the Buddhist tradition, and a wealthy aristocrat in the human tradition. Few other items of clothes so completely raise you simply buy putting them on. Of course, you have to be dead to wear it, so there is a trade-off. Good to know the history why the kimono for the death worn right-over-left. Thanks for the info. Definitely not! The dead no longer have allegiance to any clan, and the kyokatabira is perfectly white except for the sutras sometimes written on the inside.